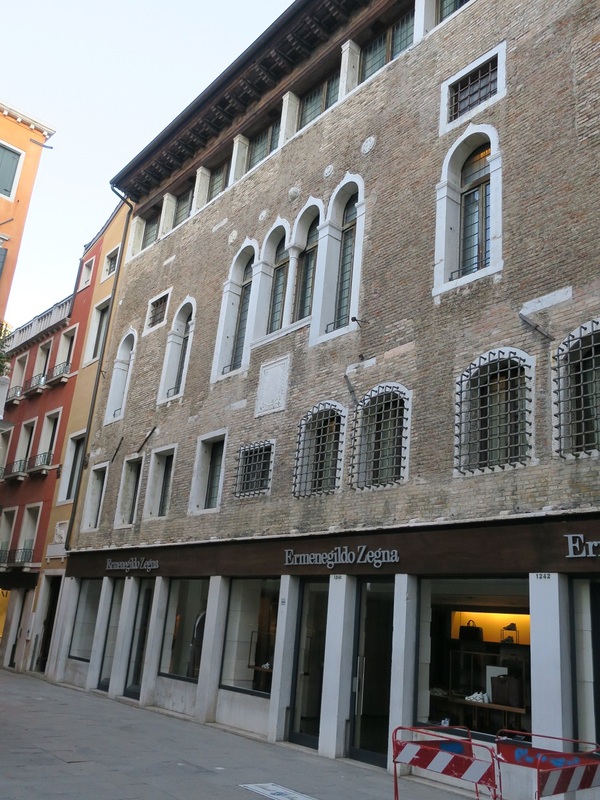 Nothing identified the Palazzo Selvadego, built in the 13th century, except a door with the winged lion of Venice above it. There were clothing stores on both sides of the door, but those told us nothing either. I felt like we were in a novel, where an innocuous doorway leads into the offices of some international spy organization. We stepped through the door and found not the Italian operations for the CIA or the MI5, but a tiny, sleek, modern hotel. 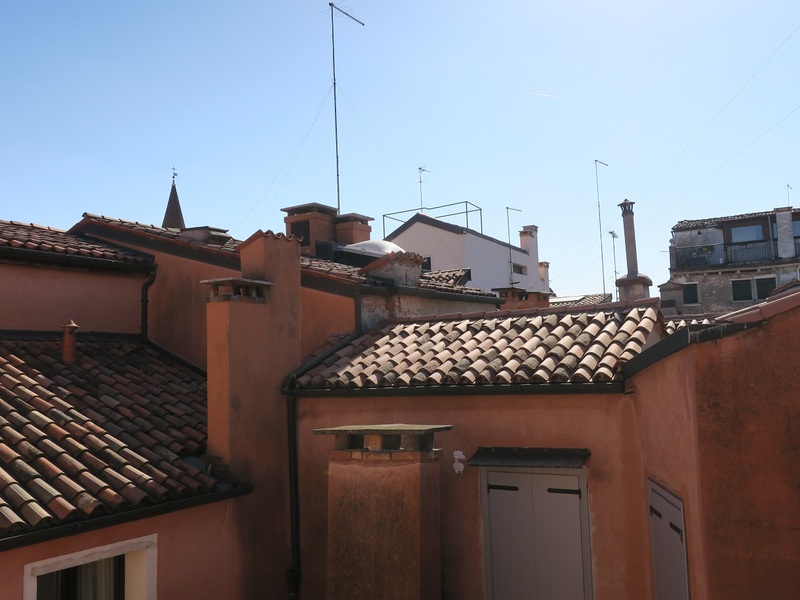 Our room faced the back, with a view of roof tops. 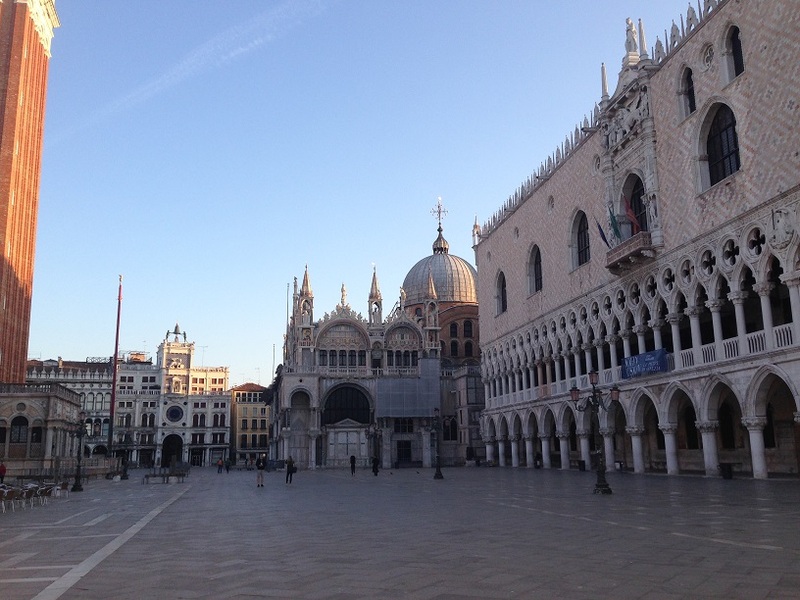 Some people in our group had room at the front of the hotel, which provided views of the Canale di San Marco. We were more than thrilled with our room and the hotel, though, as it was the perfect HQ for our exploration of Venice. 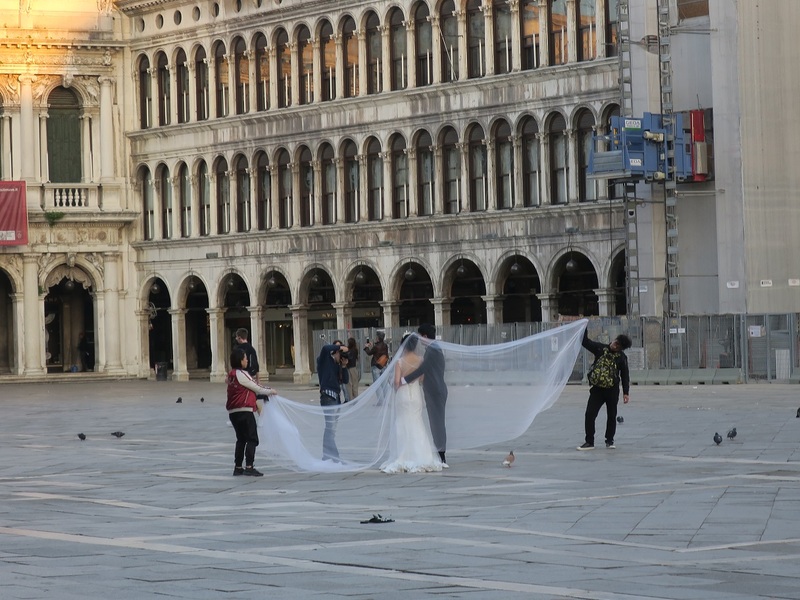 I took advantage of our location next to the Piazza San Marco by wandering the piazza early in the mornings, to take photographs of the piazza before the massive tourist crowds showed up. 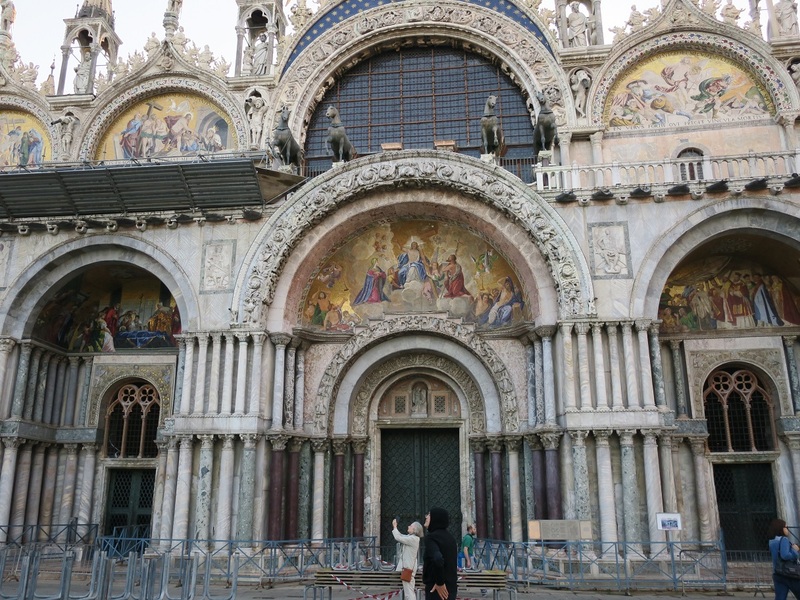 There’s a lot going on, on the facade of St. Mark’s. So let me just tell you about my favorite feature: the four copper horses above the main doors. Various websites date the horses from anytime between the 2nd and 5th centuries, but I’ll go with a University of Chicago page that says 2nd or 3rd centuries. Napoleon, then ruler of Venice, took them in 1797 and installed them on the Arc du Triomphe in Paris. The Venetians got them back in 1815. The Venetians had no cause to complain about Napoleon, however, because they had stolen the horses in the first place, probably from a chariot display in Constantinople, in 1204 during the Crusades. 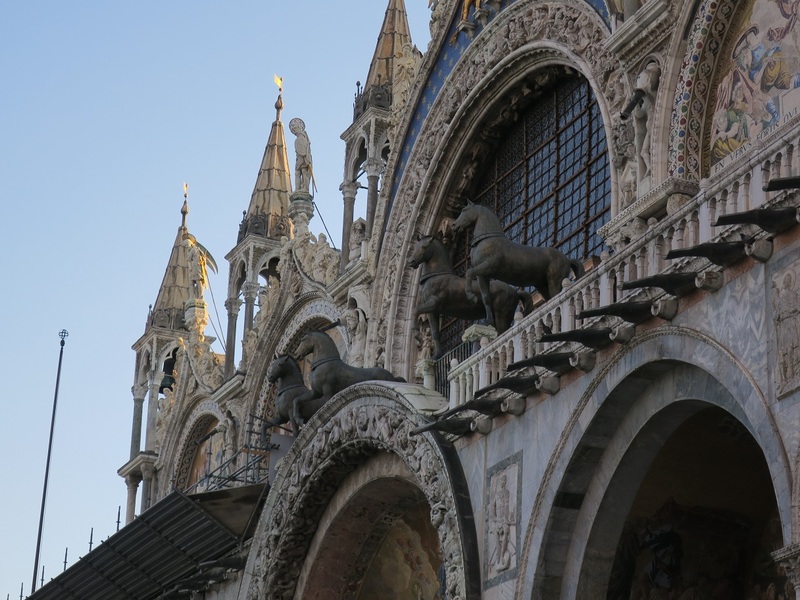 The horses currently on the church are copies — the originals are inside, in the basilica museum, to protect them from the weather. 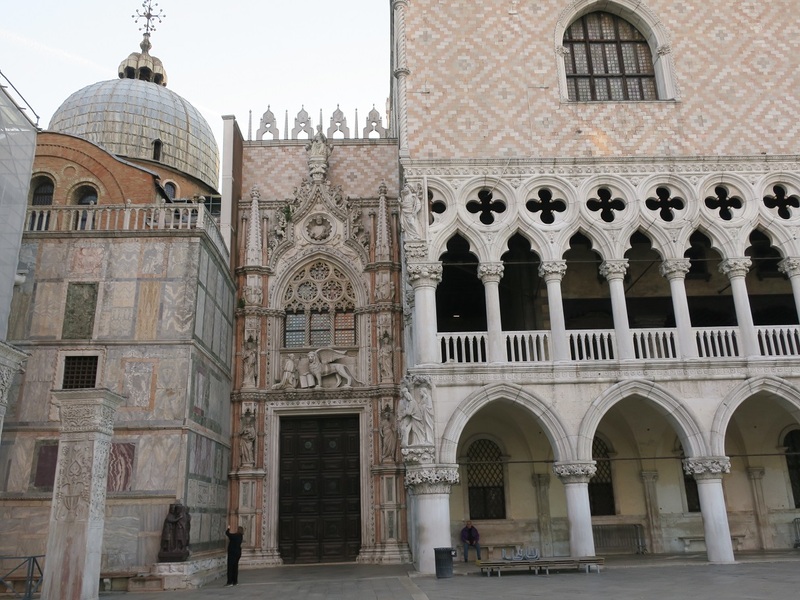 St. Mark’s body parts story, because you know that as soon as I say “saint,” there’s got to be a body parts story: After the Venetians stole his body from Alexandria and started building a cathedral for him in Venice, they lost it. But then Mark stuck his hand out of a pillar in the cathedral, so that he could be found. A pillar, it seems to me, would be a solid stone structure and an odd and difficult place to hide bones. But that’s the story. His remains were transferred to a sarcophagus in the completed basilica. 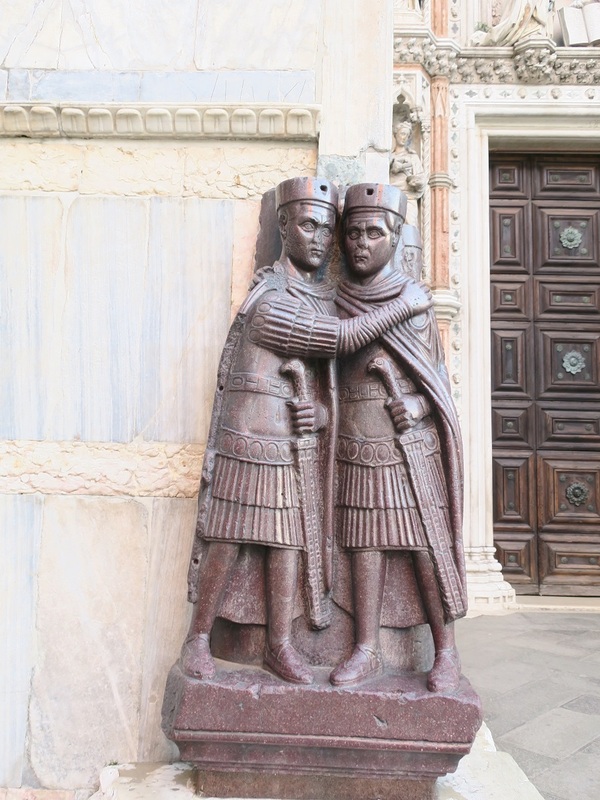 But it’s just his body that the Venetians stole. His head remained – I don’t know why – in Alexandria, and has been lost for a couple of hundred years. No photographs allowed inside the basilica. Also avoiding the crowds were bridal parties taking photographs. Palazzo Selvadego was nothing but a tiny lobby and some hotel rooms. So for the daily breakfast that was included in our tour, we trekked about 5 minutes to the Palazzo’s sister hotel — they’re both owned by the Benetton Group, whose clothing stores were once ubiquitous around the US — the Hotel Monaco. I’ve got to show you this outfit we’d pass in the window of a shop on our way to breakfast each morning. It’s what I think the Handmaid’s habit in the television show the Handmaid’s Tale would be, if the government of Gilead had a sense of humor. 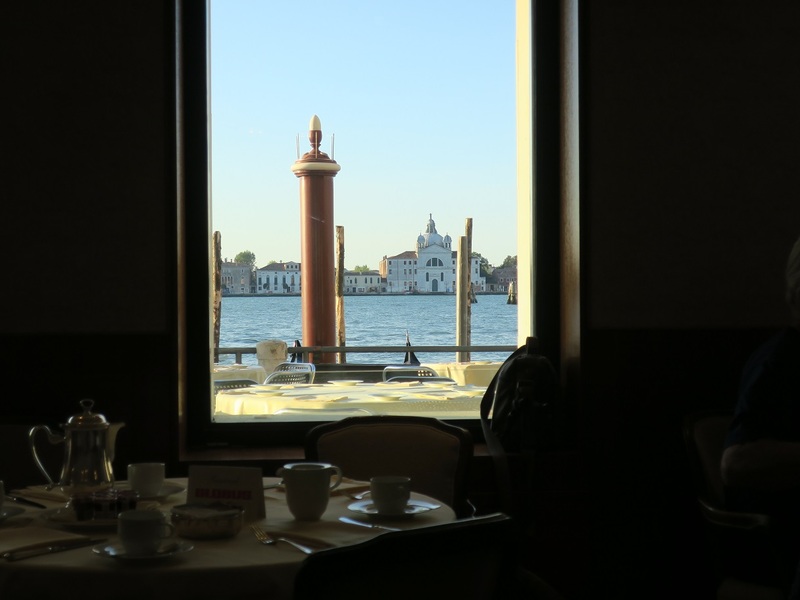 The Hotel Monaco sat directly next to the Canale di San Marco and I quickly got used to having breakfast with this view. 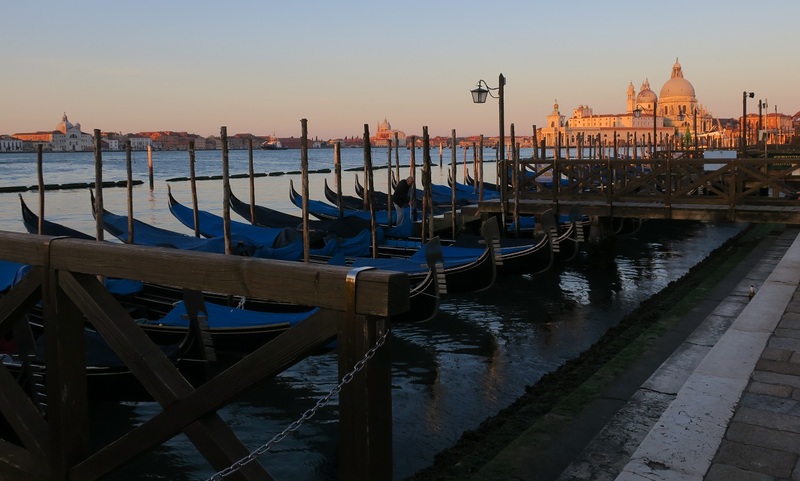 I could have lingered over coffee for hours, but the Venice was calling. 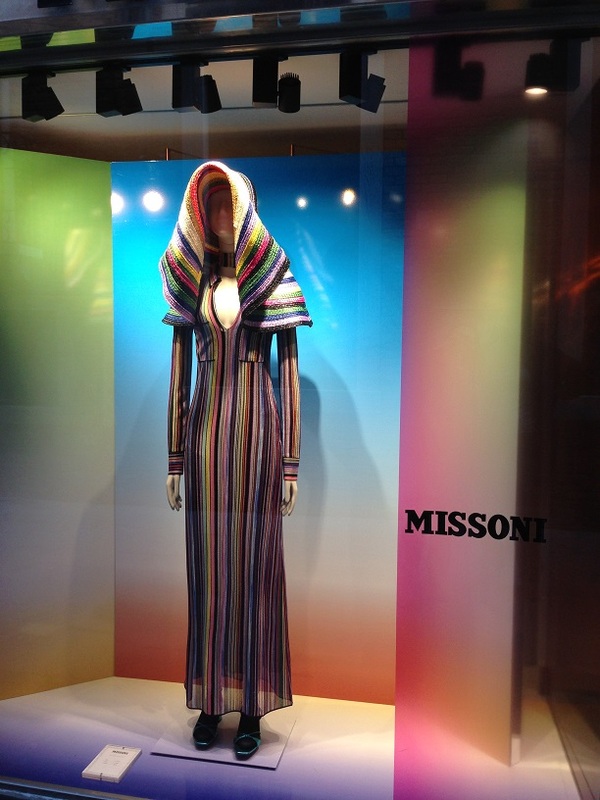 Gallery | This entry was posted in Italy Veneto. Bookmark the permalink. Incidentally, the July/August 2018 issue of VICTORIA magazine has a feature on Venice. I thought it quite timely with your current travel series (which I’ve been enjoying quite a bit). Thank you! I’ve enjoyed reliving the trip through these posts. I’ve never heard of VICTORIA magazine — I’ll have to look it up. Sounds like my kind of magazine. I’ll look for it. Not much about these stories make sense, so I trying.